Not kimchi. It's an egg scramble with tomato sauce. What? Really? A whole fish and eggs with tomato sauce. Total culture shock. PS: Please remove whatever lock is preventing more than X number of comments from appearing. I've just found the site and commented on several pieces before it told me I had to wait for moderation. Wow that's a lot of food! portion size is inappropriate... perhaps this is for boys in secondary school. The fish made me lose my appetite. GROSS! This is probably a university freshman portion. Many Chinese universities offer dorms and meal plans for students. 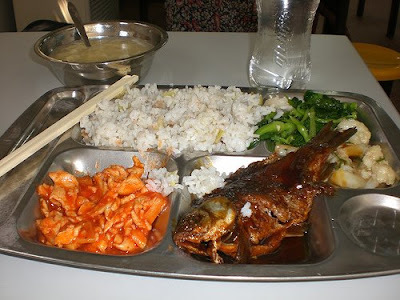 As for the fish, it is quite common for Chinese to eat a whole fish. Fish head, collar and tails are considered good eats, if prepared properly (they do gut and clean up the inside, only leaving the bone in). This is a cheaper small river fish (or farmed) that has a firm texture and is always cooked in soy sauce, brown sugar and green onion, and eaten in whole. The egg with tomato sauce tastes like scramble eggs with a bit sweetness in it. Both are very typical Chinese home made food. Everyone there knows not to eat in the school cafeteria, because the food taste terrible and the price is too high. Instead, they prefer going to the street side restaurants where they can get nice food for a lower price. Eu gostava de ler seus artigos. Esta foi uma ótima leitura para mim. Tenho marcada isso e eu estou ansioso para ler novos artigos.